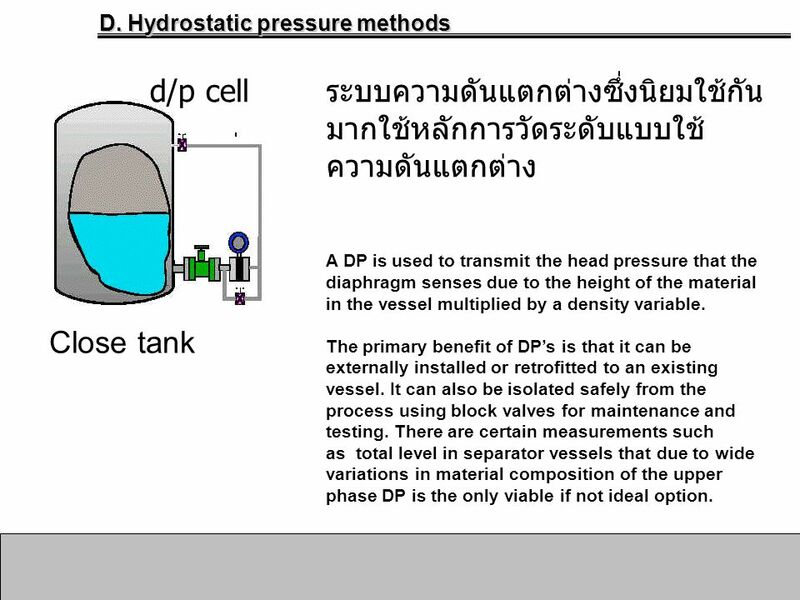 D. Hydrostatic pressure methods ถ้า level ต่ำ pressure ต้านน้อย ความดันที่วัดก็ต่ำ ถ้า level สูง pressure ต้านมาก ความดันที่วัดก็สูง Simplicity of design and low initial purchase cost are frequently given as advantages of bubblers. 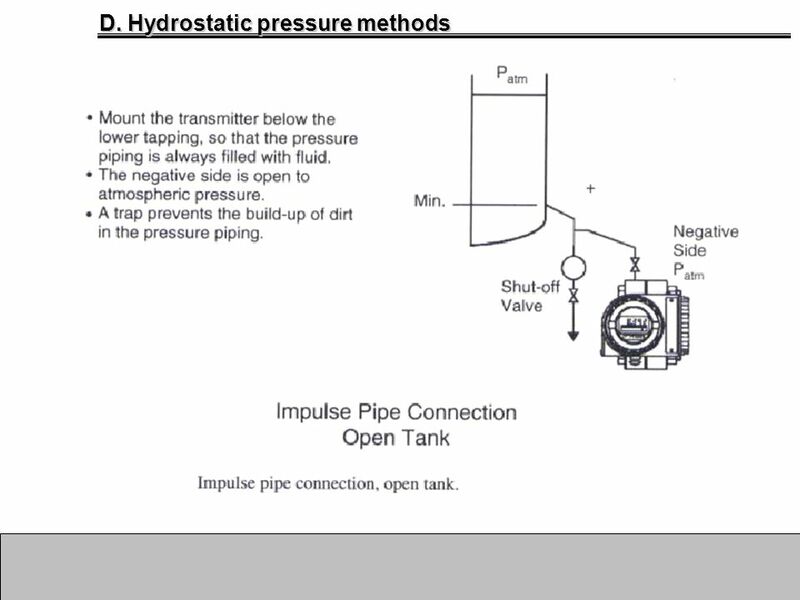 The system consists of a pipe, an air supply, a pressure transmitter and a differential pressure regulator. 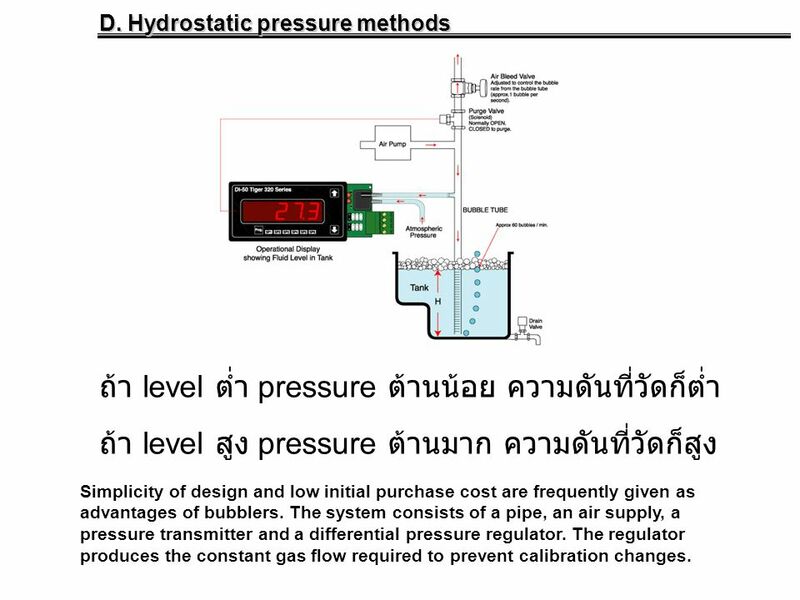 The regulator produces the constant gas flow required to prevent calibration changes. 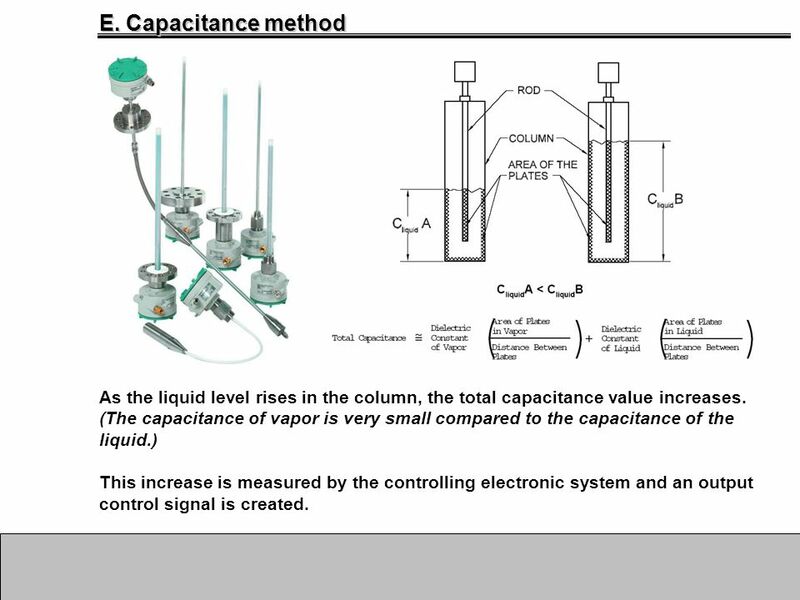 As the liquid level rises in the column, the total capacitance value increases. 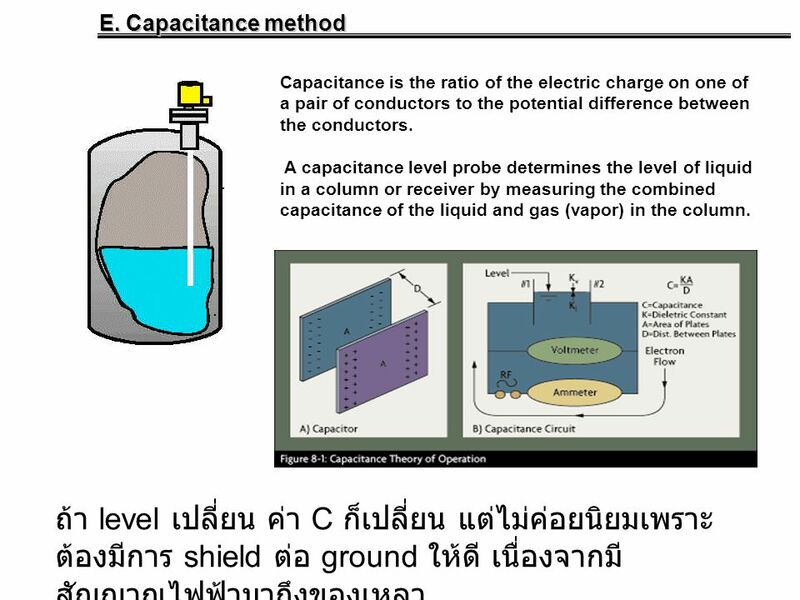 (The capacitance of vapor is very small compared to the capacitance of the liquid.) 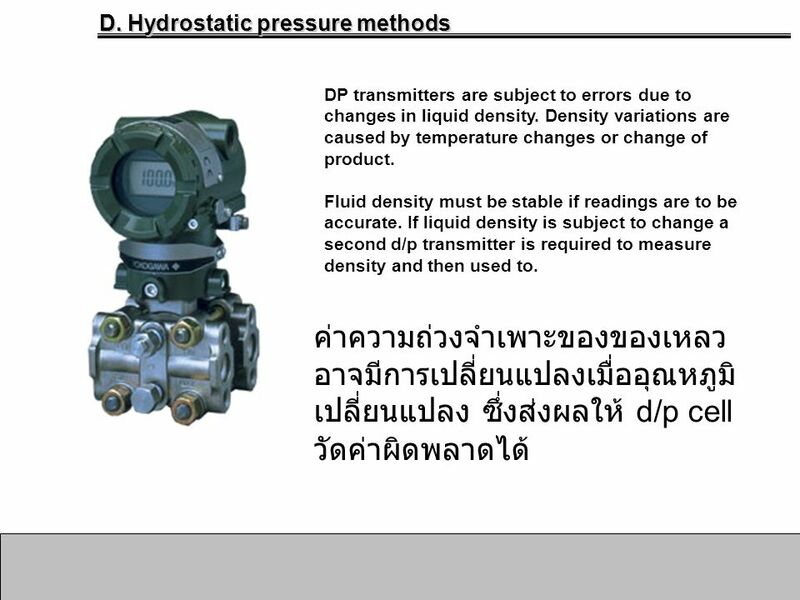 This increase is measured by the controlling electronic system and an output control signal is created. 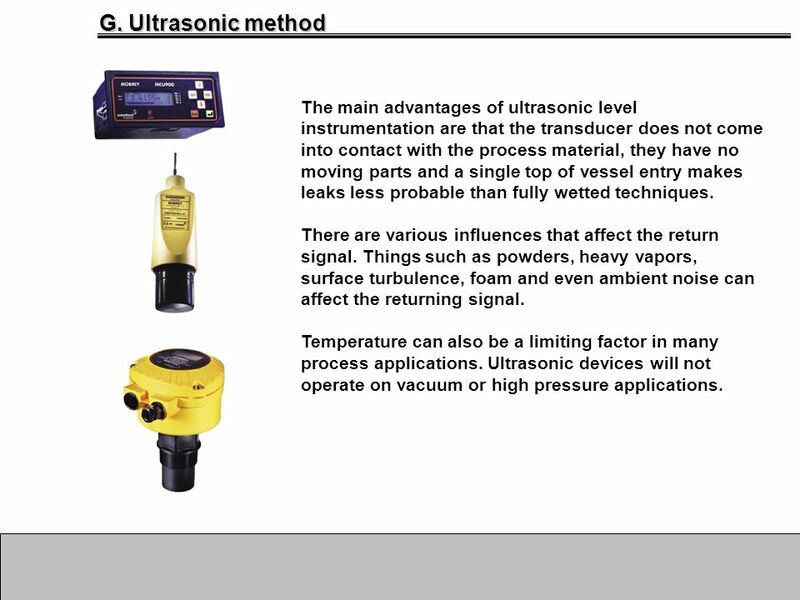 21 G. Ultrasonic method The main advantages of ultrasonic level instrumentation are that the transducer does not come into contact with the process material, they have no moving parts and a single top of vessel entry makes leaks less probable than fully wetted techniques. There are various influences that affect the return signal. Things such as powders, heavy vapors, surface turbulence, foam and even ambient noise can affect the returning signal. 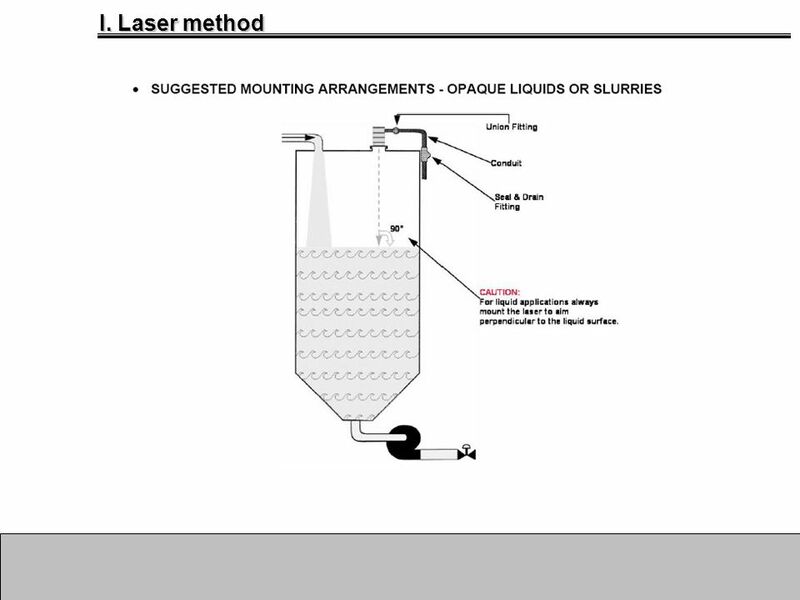 Temperature can also be a limiting factor in many process applications. 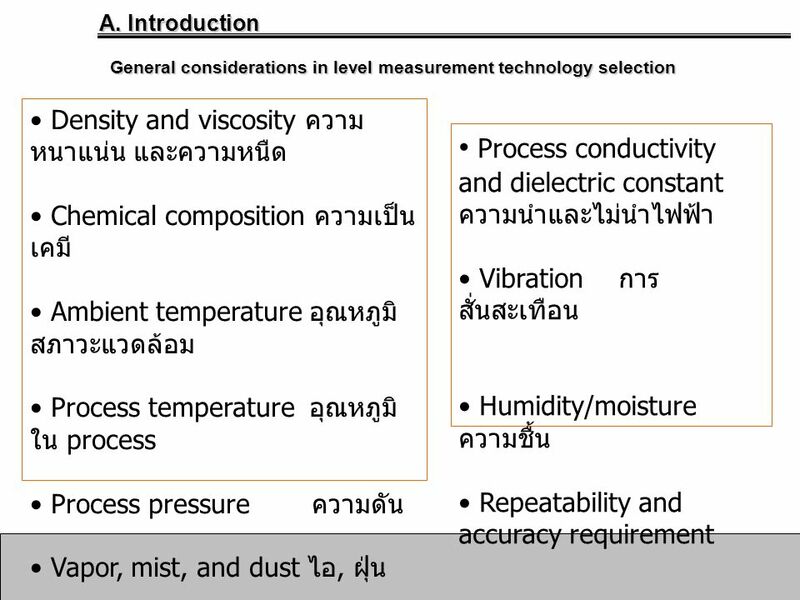 Ultrasonic devices will not operate on vacuum or high pressure applications. 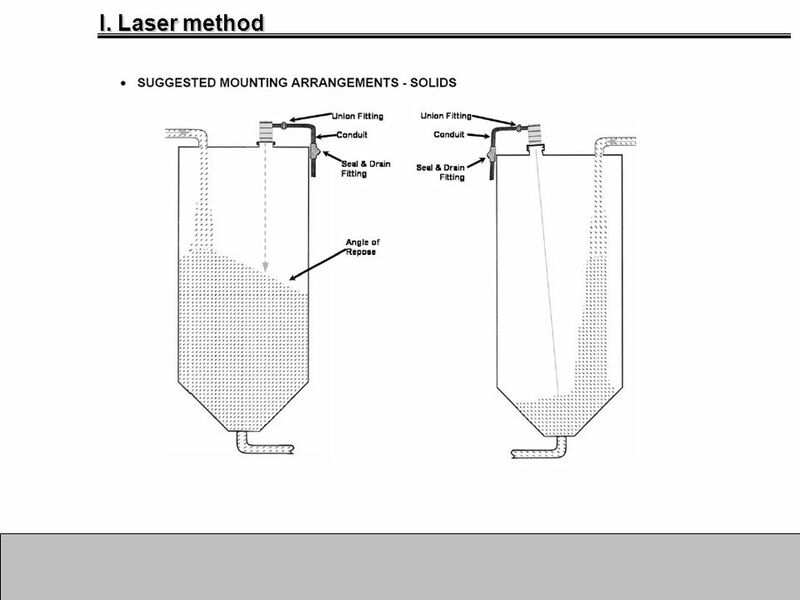 22 H. Radar method Radar is becoming a rapidly important method for measuring the level of liquids and some case of solids. The two technologies on the market are frequency modulated continuous wave (FMCW) or pulsed wave time of flight. Pulsed Wave systems emit a microwave burst towards the process material, this burst is reflected by the surface of the material and detected by the same sensor which now acts as a receiver. 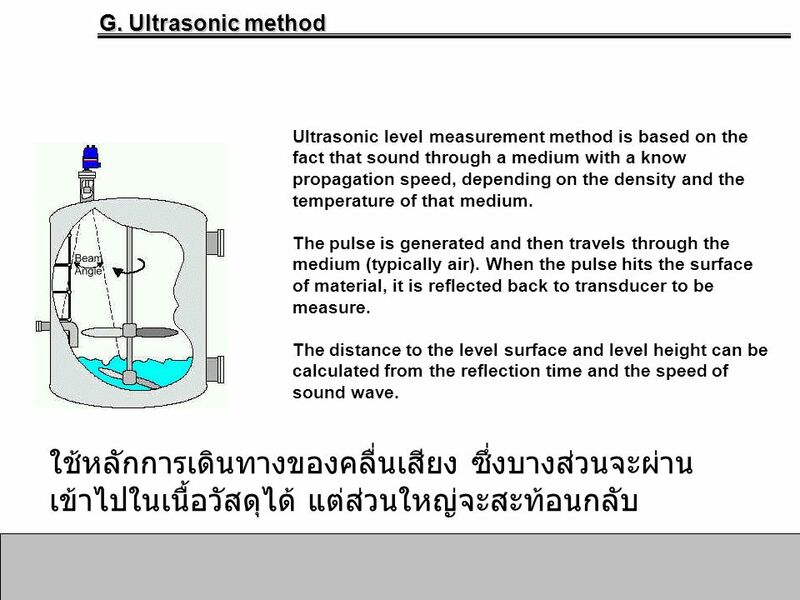 Level is inferred from the time of flight (transmission to reception) of the microwave signal. 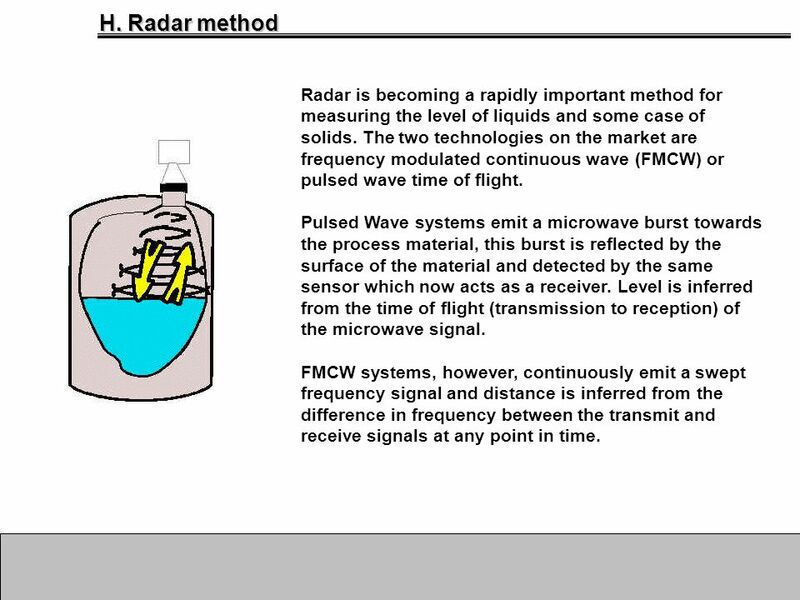 FMCW systems, however, continuously emit a swept frequency signal and distance is inferred from the difference in frequency between the transmit and receive signals at any point in time. 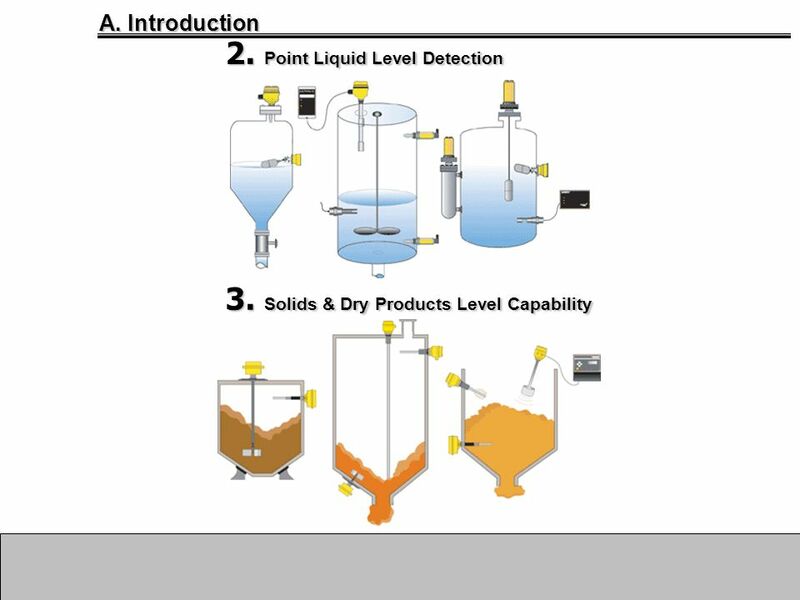 23 H. Radar method This non-contact technology produces highly accurate measurements in storage tanks and some process vessels. 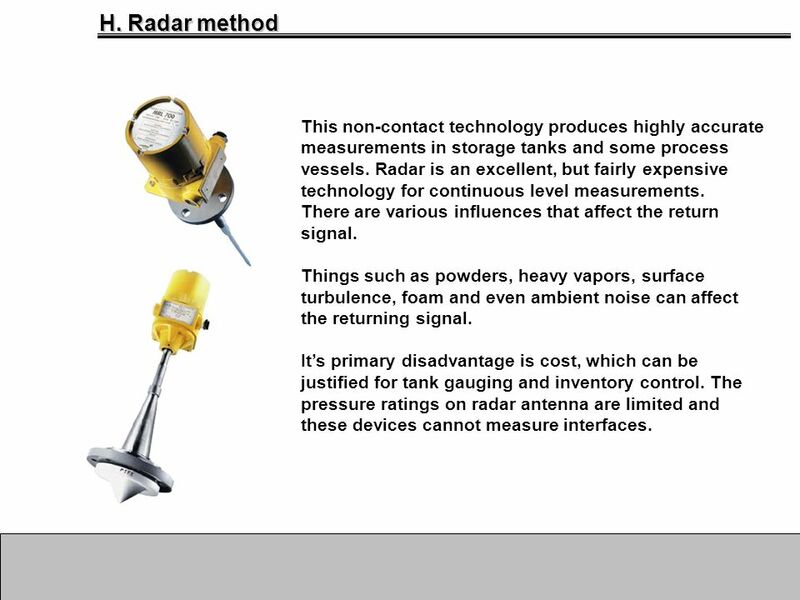 Radar is an excellent, but fairly expensive technology for continuous level measurements. There are various influences that affect the return signal. Things such as powders, heavy vapors, surface turbulence, foam and even ambient noise can affect the returning signal. 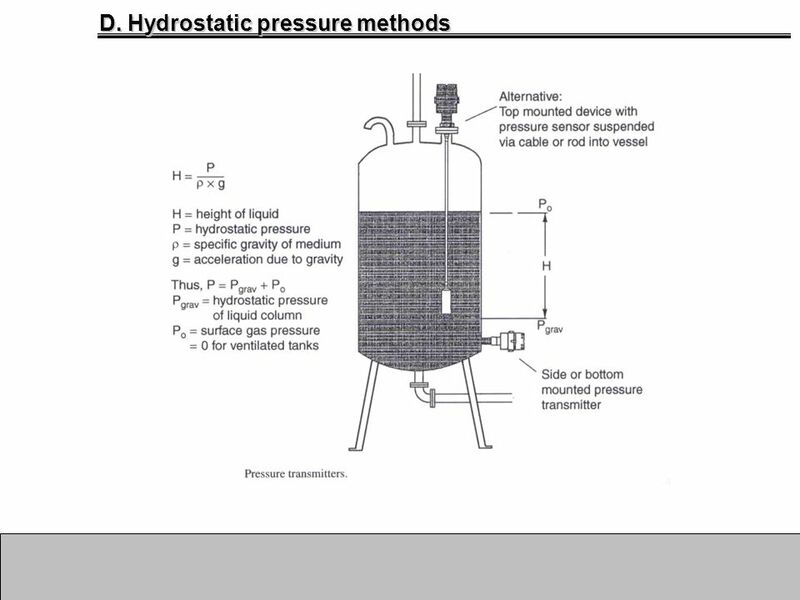 It’s primary disadvantage is cost, which can be justified for tank gauging and inventory control. 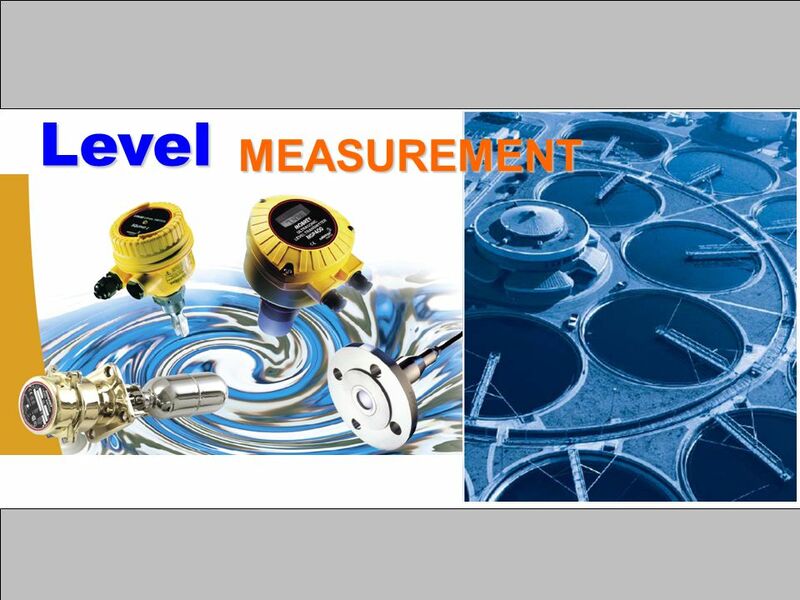 The pressure ratings on radar antenna are limited and these devices cannot measure interfaces. 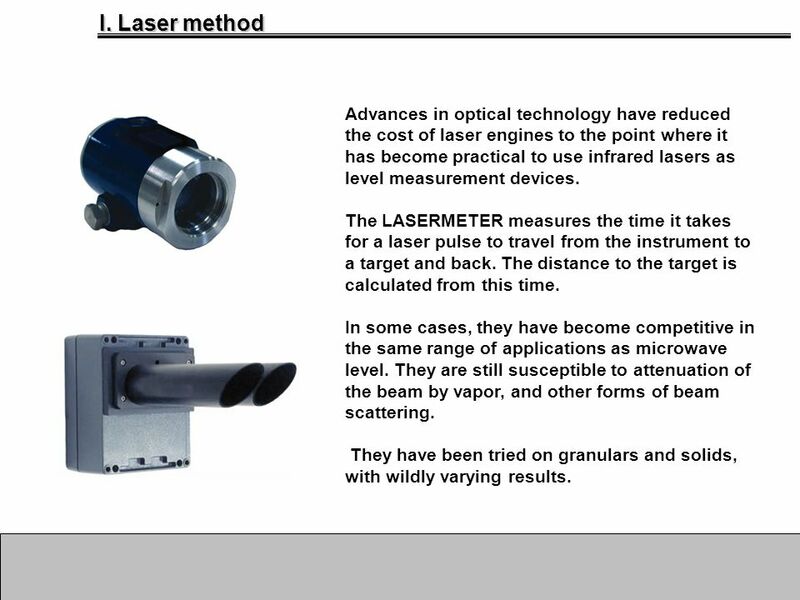 24 I. Laser method Advances in optical technology have reduced the cost of laser engines to the point where it has become practical to use infrared lasers as level measurement devices. 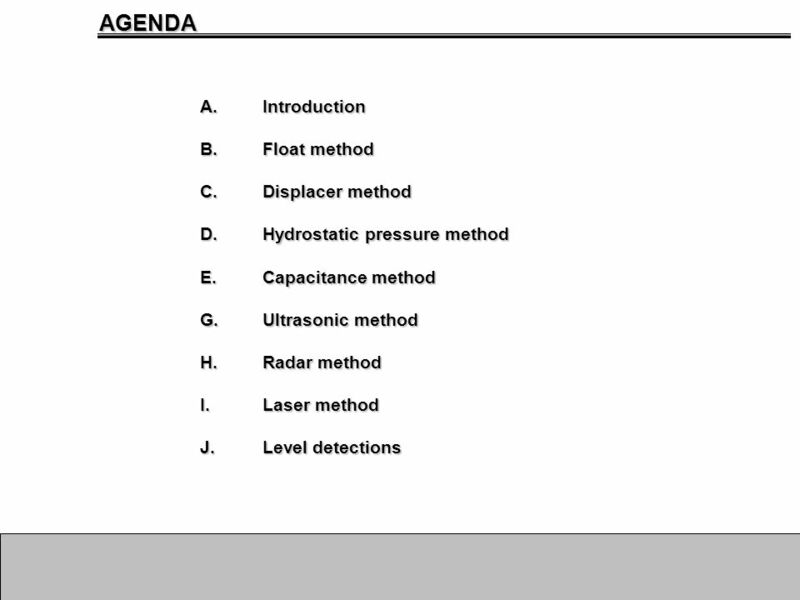 The LASERMETER measures the time it takes for a laser pulse to travel from the instrument to a target and back. The distance to the target is calculated from this time. 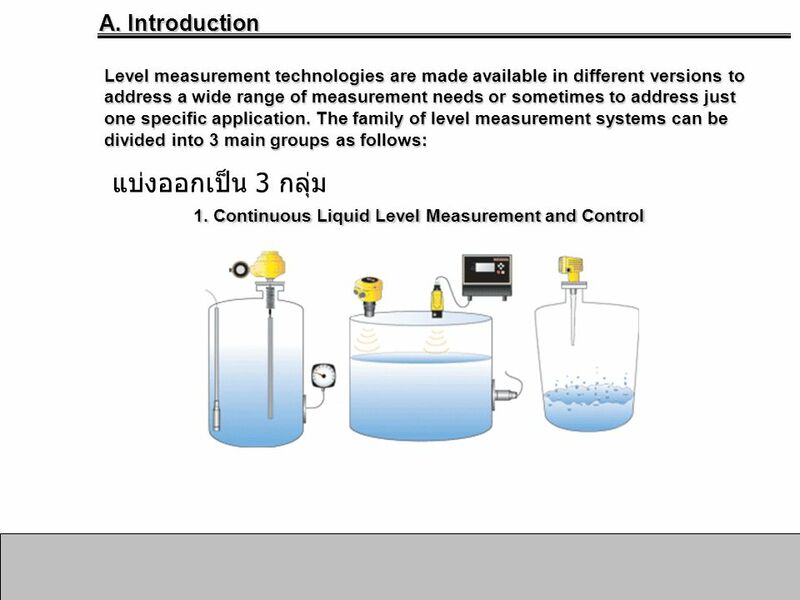 In some cases, they have become competitive in the same range of applications as microwave level. 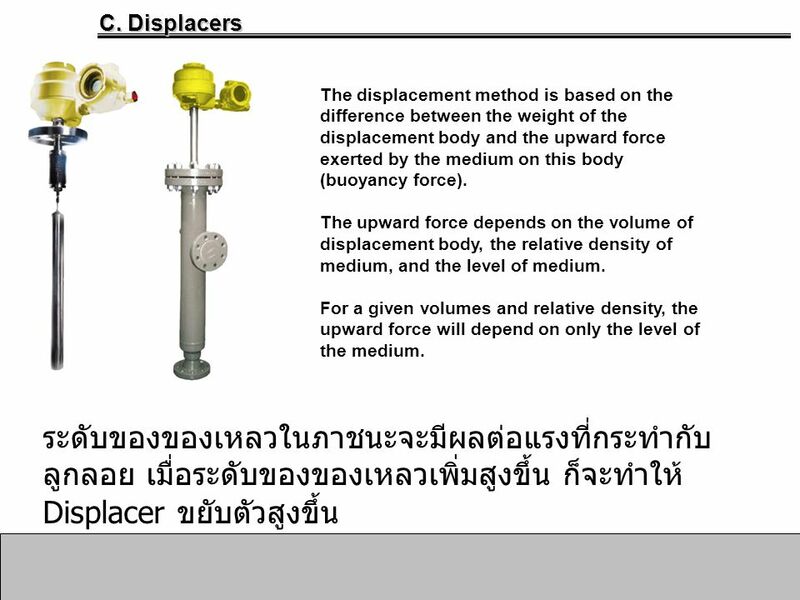 They are still susceptible to attenuation of the beam by vapor, and other forms of beam scattering. They have been tried on granulars and solids, with wildly varying results. 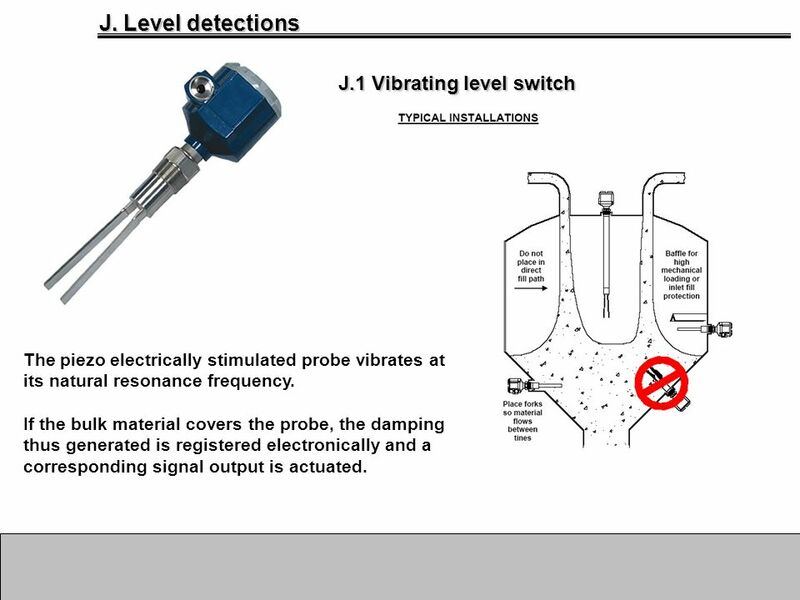 The piezo electrically stimulated probe vibrates at its natural resonance frequency. 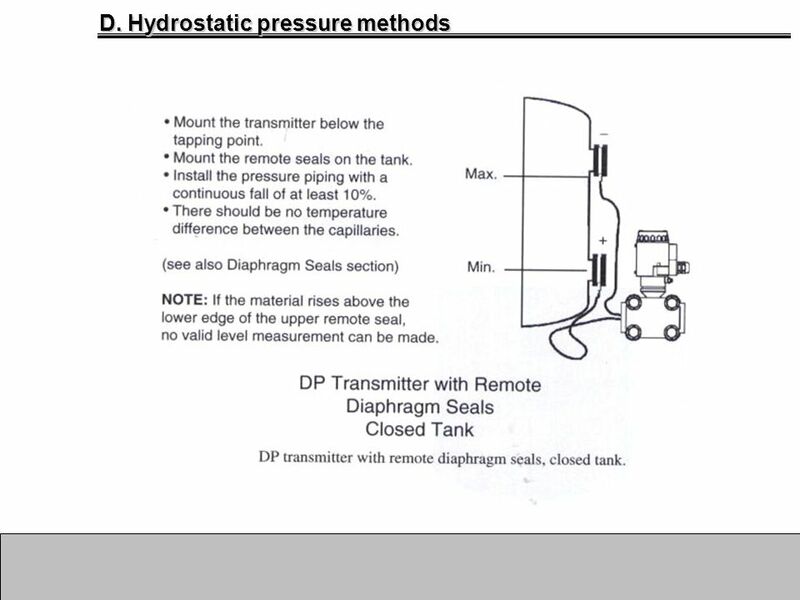 If the bulk material covers the probe, the damping thus generated is registered electronically and a corresponding signal output is actuated. 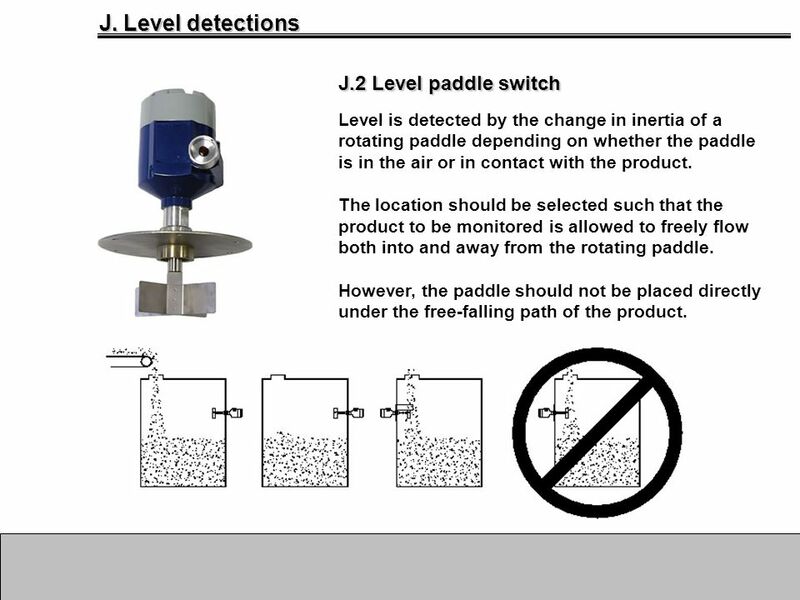 Level is detected by the change in inertia of a rotating paddle depending on whether the paddle is in the air or in contact with the product. 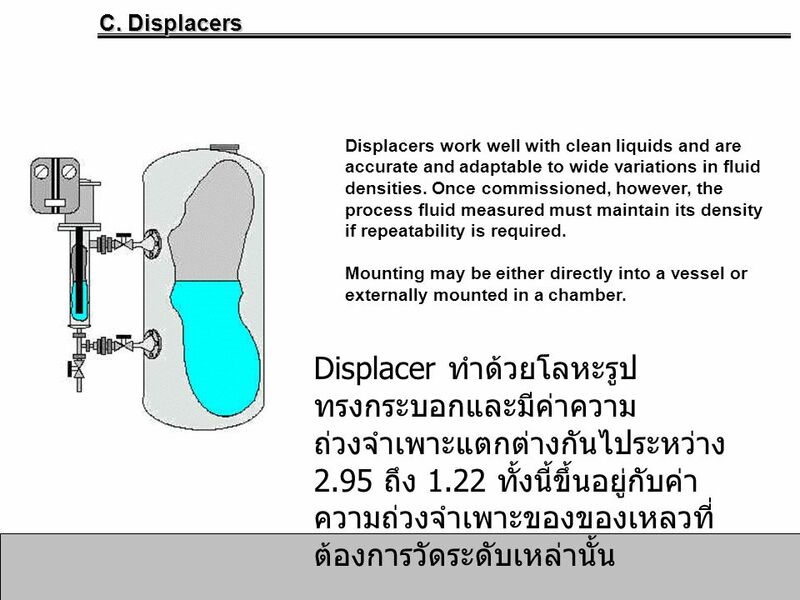 The location should be selected such that the product to be monitored is allowed to freely flow both into and away from the rotating paddle. However, the paddle should not be placed directly under the free-falling path of the product. 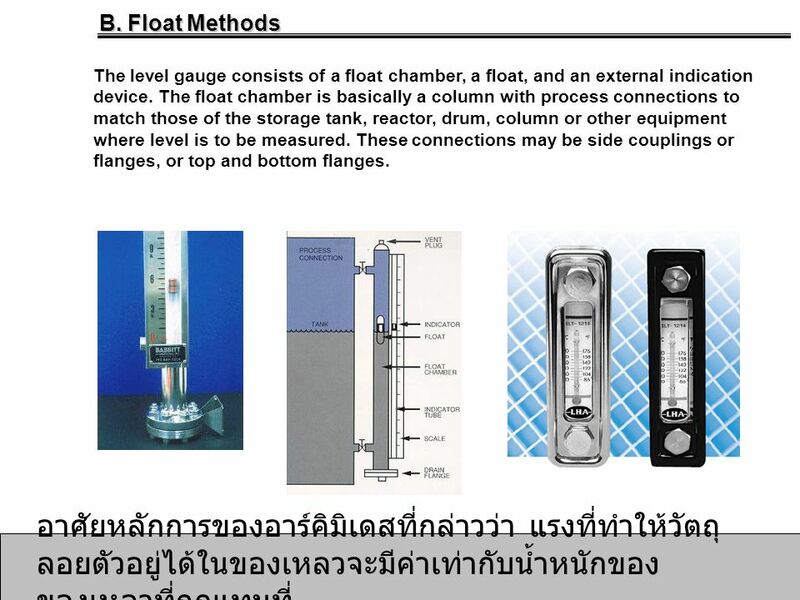 This method is suitable only for level measure-ment in conductive liquids. 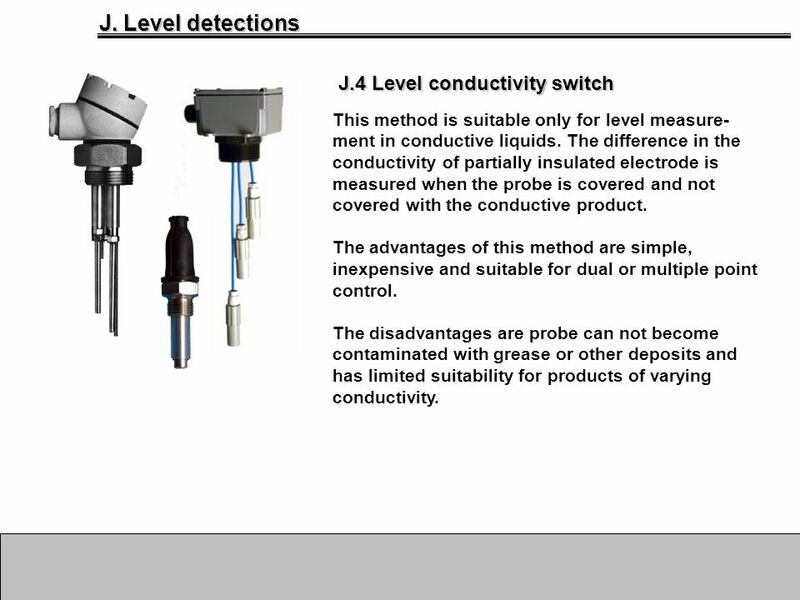 The difference in the conductivity of partially insulated electrode is measured when the probe is covered and not covered with the conductive product. 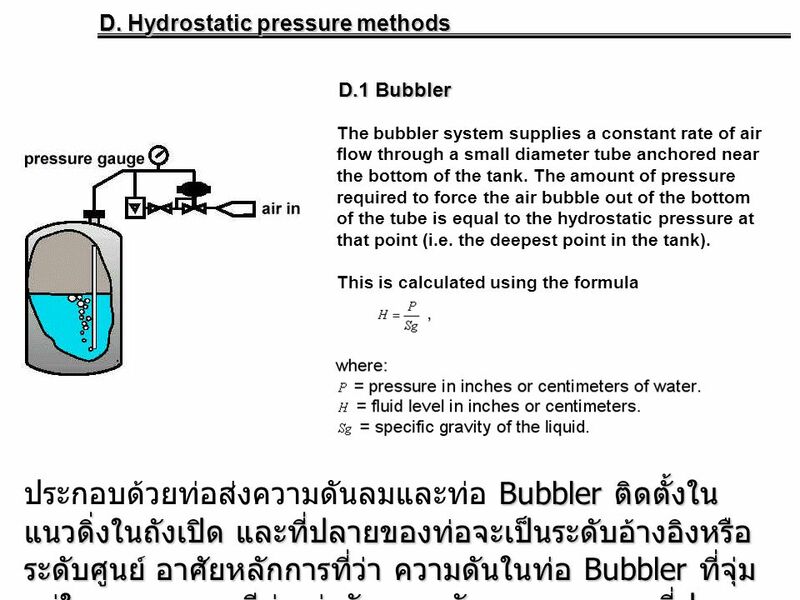 The advantages of this method are simple, inexpensive and suitable for dual or multiple point control. 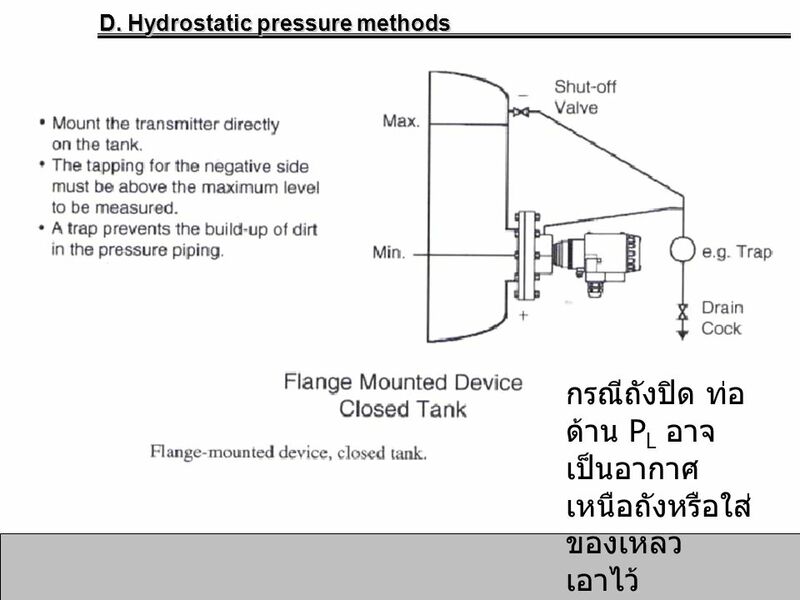 The disadvantages are probe can not become contaminated with grease or other deposits and has limited suitability for products of varying conductivity. 1 Out line Measurement Quantity System of quantity Base quantity Derived quantity Ordinal quantity Measurement standard Testing Traceability Is hardness. นายรังสฤษดิ์ตั้งคณา รหัส นายวสันต์ ชานุชิต รหัส อาจารย์ที่ปรึกษาโครงการ ผศ. ดร. ดารณี หอมดี อาจารย์ที่ปรึกษาโครงการร่วม ดร. วาธิส. 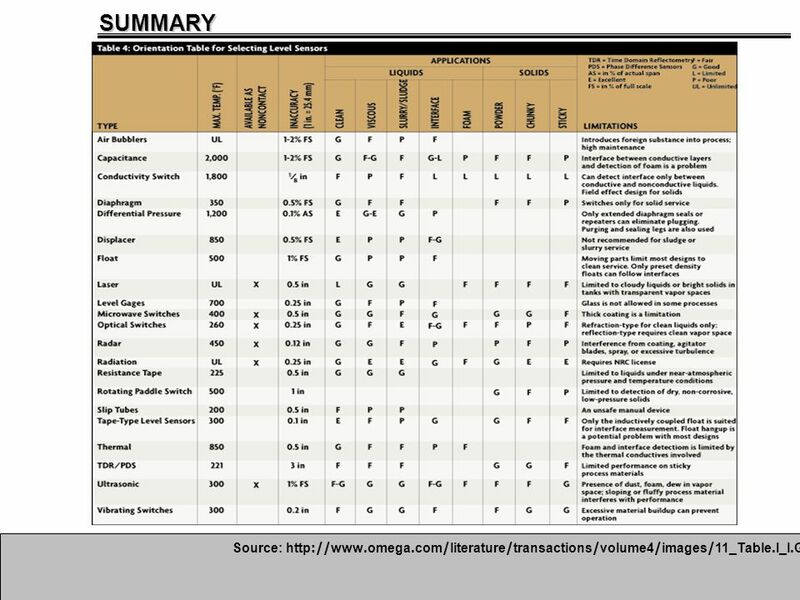 VARIABLES, EXPRESSION and STATEMENTS. 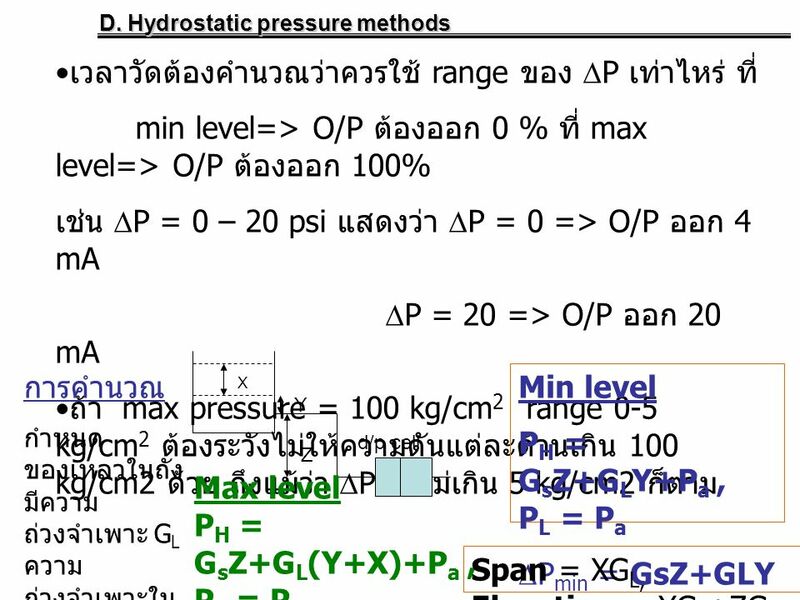 Values and Data Types Value เป็นสิ่งพื้นฐาน มีลักษณะเป็น ตัวอักษร หรือ ตัวเลข อาทิ 2+2 หรือ “Hello world” Value.